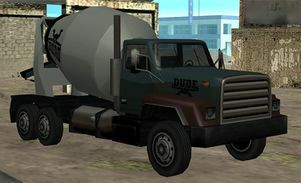 The Cement Truck as depicted in Grand Theft Auto: San Andreas (Rear quarter view). The Cement Truck is a large truck-based cement mixer in Grand Theft Auto: San Andreas. The Cement Truck is evidently a cement mixer mounted on a large standard cab truck chassis. The vehicle is thus heavy but powerful and once it accelerates to full speed, it is difficult to stop. The Cement Truck is also revealed to be unstable, often tipping over to its side on rough terrain. The truck also bears logos of the DUDE company of construction equipment and vehicles. The cement function is static, so it can not dispense any cement; however on one mission a cutscene shows the cement pouring out. Although cement cannot be dispensed, the back barrel's rotating rate can be adjusted; this can affect the balance of the Cement Truck in some cases. The default radio station in the Cement Truck is K-DST. Driving around the industrial parts of Los Santos, like Ocean Docks and southern Willowfield. Two are located in the Angel Pine Junkyard in Angel Pine, Whetstone. This page was last modified on 6 August 2012, at 20:03.